We spoke once again with renowned map collector David Rumsey. 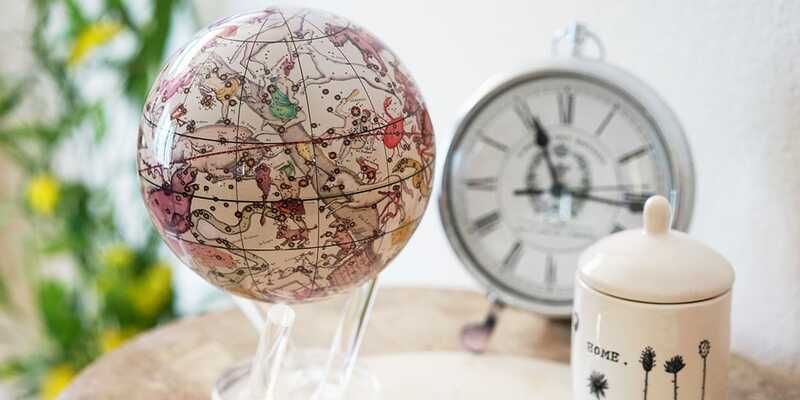 He told us more about the details and history behind our newest MOVA Globe, Antique Celestial. We also discussed some of the first maps he collected as well as what he’s currently hunting for to add to his collection. MOVA: What is unique about the depiction of the constellations on the Antique Celestial globe? David Rumsey: Partly the art. So beautiful the way he’s [Giovanni Maria Cassini] drawn them and colored them. The way this globe works is similar to most globes made at the time. Gods eye view. As if God was outside the whole universe and looking back in and seeing it as a globe. When you look at the Celestial globe you are seeing constellations in reverse from the way you would from the center of the earth. Telescopes from the area show things in reverse. When this globe was put into Google Sky in 2008 they had to reverse it and they were amazed that star positions were amazingly correct. Allowing for the change in time from 1790 to today and the procession of the sky because of the way the Earth rotates, the sky actually shifts. They know how much it shifted between 1792 and today and things lined up perfectly. He definitely had very good information and what was known of the other celestial knowledge of the time. Were celestial maps popular during the time? How does this celestial map compare to the the other ones of the era? Celestial globes were very popular at the time and Antique’s Celestial globe stands out for its wonderful artistry and accuracy. 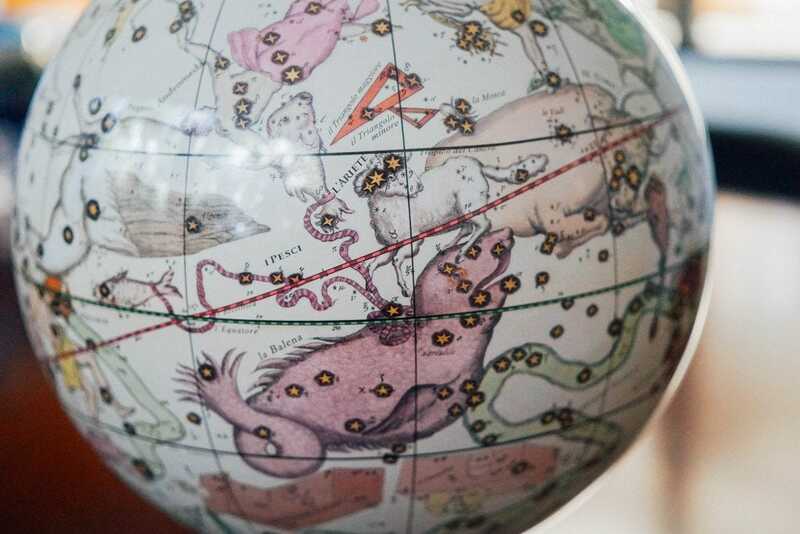 The Antique Celestial globe is incredibly detailed – what are some things people should look for on the map? My favorites are the constellations Il Toro (the Bull) and Il Leone (the Lion). I also like the Telescope constellation – here is some background on that: Telescopium was introduced in 1751–52 by Nicolas Louis de Lacaille with the French name le Telescope, depicting an aerial telescope, after he had observed and cataloged 10,000 southern stars during a two-year stay at the Cape of Good Hope. He devised 14 new constellations in uncharted regions of the Southern Celestial Hemisphere not visible from Europe. All but one honored instruments that symbolised the Age of Enlightenment. Covering 40 degrees of the night sky, the telescope stretched out northwards between Sagittarius and Scorpius. Lacaille had Latinised its name to Telescopium by 1763. Why are some of the drawings outlined in dashed lines? I think they are the more modern constellations introduced by Lacaille and perhaps others. Notice that all are in the Southern Hemisphere, not visible from Europe. The stars on the globe vary in size. What does this signify? Stars are illustrated at various sizes depending on their magnitude. How did the works of John Flamsteed and Nicolas Louis de La Caille​ influence Cassini in creating the globe? Although different in subject and appearance, what can we learn by viewing the Terrestrial and Celestial globes side by side? It was normal practice in Cassini’s time for globemakers to issue a pair of globes together – the terrestrial and the celestial. Looking at the Celestial globe we see the universe in “god’s eye” view – as god would see it from outside the universe. The celestial globe gives context to the terrestrial globe and shows that even though both globes are the same size, the earth is tiny compared to the immensity of the universe. Seeing them together invites contemplation on man’s place in the order of things. MOVA: Tell us about when your collection first started – when did you realize it was more than a hobby and what were some of the first maps? David Rumsey: I began my collection in the 1970’s by collecting modern maps and then moving into old maps. I quickly knew it was more than a hobby because I was amassing a huge number of maps! 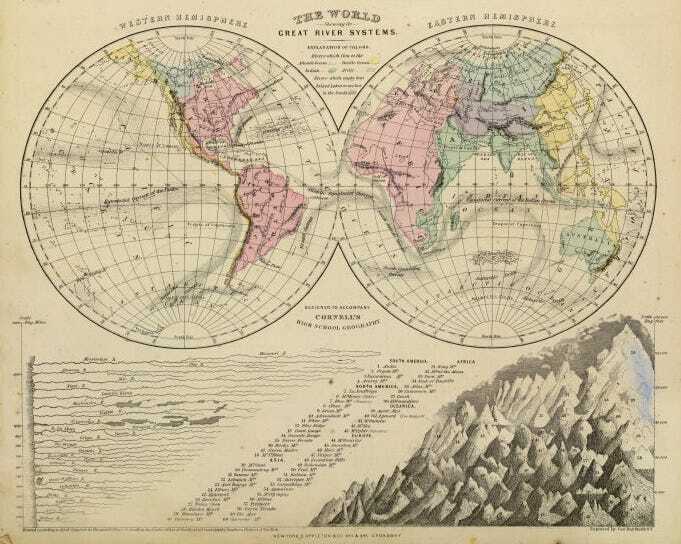 Some of the first maps I collected were children’s atlases for study, made in the early 1800s. How do you search for and find new maps to add to your collection? I use dealers, other collectors, ebay, the internet, and even the phone! Are there any kinds of maps you are still looking to add to your collection that you haven’t been able to get yet? Yes, I am currently very excited about 20th century pictorial maps and am looking for them everywhere. 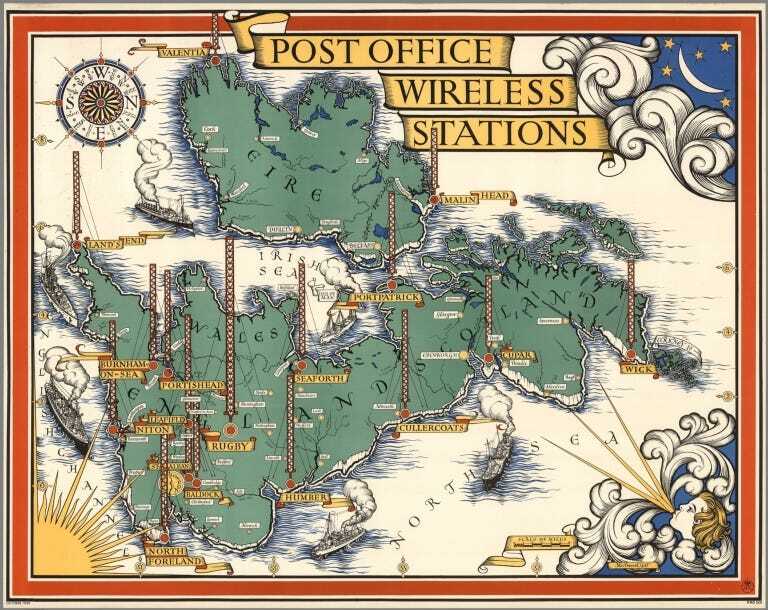 These are the decorative and whimsical maps especially issued in the 1920s and 1930s. If you search my site for pictorial map you will see the roughly 2,300 maps I have assembled so far. Why did you decide to donate your collection to Stanford University and what’s your main goal for the soon-to-be-built David Rumsey Map Center? I chose Stanford because I had a long relationship with the library there as a member of its advisory board. So I knew how strong the Stanford library was in the field of digital technology which was very important to me because I was donating not only the physical maps but also the digital images of them. Stanford can handle both very well. They are also close to where I live so I can stay involved with the Rumsey Map Center, going into the future – and I can visit my maps frequently! My hope for the map center is that it will become a pioneer and leader in both the study of maps and the making of maps for the modern era of big data. And doing this by having the finest collection of original maps plus the best digital tools to work with them. Join us on our Facebook page to tell us what you think of the Antique Celestial MOVA Globe or anything else you read in this post.